Drummers are different, and so is the Drum Kit VOICE... find out why! The Motif XF offers a wide variety of tools for Drum Track Construction. Although there are no strict rules about how you go about composing your musical compositions, it is a fairly standard practice to begin by building the tracks up from the bottom up - at least when using MIDI gear. 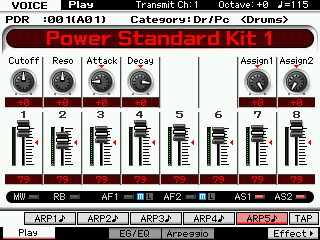 This often means constructing a basic drum groove on which to build the composition. This article is not meant to dictate how you should work, but is intended to make you aware of some of the powerful tools at your disposal. Read through it and I am sure you will discover something that might be of use to you at some point in using the Motif XF. • What is a Drum Voice and how is it different from a Normal Voice? • What is a PATTERN Phrase and what is PATTERN Patch? • What is Divide Drum Track?